"Second stage" redirects here. For other uses, see diving regulator, reading (legislature), and Second Stage Theatre. "Third stage" redirects here. For the Boston album, see Third Stage. By jettisoning stages when they run out of propellant, the mass of the remaining rocket is decreased. Each successive stage can also be optimized for its specific operating conditions, such as decreased atmospheric pressure at higher altitudes. This staging allows the thrust of the remaining stages to more easily accelerate the rocket to its final speed and height. In serial or tandem staging schemes, the first stage is at the bottom and is usually the largest, the second stage and subsequent upper stages are above it, usually decreasing in size. In parallel staging schemes solid or liquid rocket boosters are used to assist with launch. These are sometimes referred to as "stage 0". In the typical case, the first-stage and booster engines fire to propel the entire rocket upwards. When the boosters run out of fuel, they are detached from the rest of the rocket (usually with some kind of small explosive charge) and fall away. The first stage then burns to completion and falls off. This leaves a smaller rocket, with the second stage on the bottom, which then fires. Known in rocketry circles as staging, this process is repeated until the desired final velocity is achieved. In some cases with serial staging, the upper stage ignites before the separation—the interstage ring is designed with this in mind, and the thrust is used to help positively separate the two vehicles. A multistage rocket is required to reach orbital speed. Single-stage-to-orbit designs are sought, but have not yet been demonstrated. is the natural logarithm function. The delta v required to reach low Earth orbit (or the required velocity of a sufficiently heavy suborbital payload) requires a wet to dry mass ratio larger than can realistically be achieved in a single rocket stage. The multistage rocket overcomes this limit by splitting the delta-v into fractions. As each lower stage drops off and the succeeding stage fires, the rest of the rocket is still traveling near the burnout speed. Each lower stage's dry mass includes the propellant in the upper stages, and each succeeding upper stage has reduced its dry mass by discarding the useless dry mass of the spent lower stages. A further advantage is that each stage can use a different type of rocket engine, each tuned for its particular operating conditions. Thus the lower-stage engines are designed for use at atmospheric pressure, while the upper stages can use engines suited to near vacuum conditions. Lower stages tend to require more structure than upper as they need to bear their own weight plus that of the stages above them. Optimizing the structure of each stage decreases the weight of the total vehicle and provides further advantage. The advantage of staging comes at the cost of the lower stages lifting engines which are not yet being used, as well as making the entire rocket more complex and harder to build than a single stage. In addition, each staging event is a possible point of launch failure, due to separation failure, ignition failure, or stage collision. Nevertheless, the savings are so great that every rocket ever used to deliver a payload into orbit has had staging of some sort. These equations show that a higher specific impulse means a more efficient rocket engine, capable of burning for longer periods of time. In terms of staging, the initial rocket stages usually have a lower specific impulse rating, trading efficiency for superior thrust in order to quickly push the rocket into higher altitudes. Later stages of the rocket usually have a higher specific impulse rating because the vehicle is further outside the atmosphere and the exhaust gas does not need to expand against as much atmospheric pressure. Partition the problem calculations into however many stages the rocket system comprises. Calculate the initial and final mass for each individual stage. Calculate the burnout velocity, and sum it with the initial velocity for each individual stage. Assuming each stage occurs immediately after the previous, the burnout velocity becomes the initial velocity for the following stage. Repeat the previous two steps until the burnout time and/or velocity has been calculated for the final stage. It is important to note that the burnout time does not define the end of the rocket stage's motion, as the vehicle will still have a velocity that will allow it to coast upward for a brief amount of time until the acceleration of the planet's gravity gradually changes it to a downward direction. The velocity and altitude of the rocket after burnout can be easily modeled using the basic physics equations of motion. These performance ratios can also be used as references for how efficient a rocket system will be when performing optimizations and comparing varying configurations for a mission. The Saturn V multistage rocket carrying Apollo 11 lifts off, seen from the launch tower camera. The Saturn V's S-IC stage was designed to carry the rocket through the first 61 kilometres of ascent. Also visible is the launch escape system, a single-stage solid fuel rocket designed for the crew to escape the Saturn V in the event of an impending catastrophic failure. where g is the gravity constant of the planet (which is Earth in most cases). This also enables the volume of storage required for the fuel to be calculated if the density of the fuel is known, which is almost always the case when designing the rocket stage. The volume is yielded when dividing the mass of the propellant by its density. Asides from the fuel required, the mass of the rocket structure itself must also be determined, which requires taking into account the mass of the required thrusters, electronics, instruments, power equipment, etc. These are known quantities for typical off the shelf hardware that should be considered in the mid to late stages of the design, but for preliminary and conceptual design, a simpler approach can be taken. Assuming one engine for a rocket stage provides all of the total impulse for that particular segment, a mass fraction can be used to determine the mass of the system. The mass of the stage transfer hardware such as initiators and safe-and-arm devices are very small by comparison and can be considered negligible. is the mass of the fuel. This mixture ratio not only governs the size of each tank, but also the specific impulse of the rocket. Determining the ideal mixture ratio is a balance of compromises between various aspects of the rocket being designed, and can vary depending on the type of fuel and oxidizer combination being used. For example, a mixture ratio of a bipropellant could be adjusted such that it may not have the optimal specific impulse, but will result in fuel tanks of equal size. This would yield simpler and cheaper manufacturing, packing, configuring, and integrating of the fuel systems with the rest of the rocket, and can become a benefit that could outweigh the drawbacks of a less efficient specific impulse rating. But suppose the defining constraint for the launch system is volume, and a low density fuel is required such as hydrogen. This example would be solved by using an oxidizer-rich mixture ratio, reducing efficiency and specific impulse rating, but will meet a smaller tank volume requirement. The next stage is always a smaller size than the previous stage. Similar stages should provide similar ΔV. Where n is the number of stages the rocket system comprises. Similar stages yielding the same payload ratio simplify this equation, however that is seldom the ideal solution for maximizing payload ratio, and ΔV requirements may have to be partitioned unevenly as suggested in guideline tips 1 and 2 from above. Two common methods of determining this perfect ΔV partition between stages are either a technical algorithm that generates an analytical solution that can be implemented by a program, or simple trial and error. For the trial and error approach, it is best to begin with the final stage, calculating the initial mass which becomes the payload for the previous stage. From there it is easy to progress all the way down to the initial stage in the same manner, sizing all the stages of the rocket system. Restricted rocket staging is based on the simplified assumption that each of the stages of the rocket system have the same specific impulse, structural ratio, and payload ratio, the only difference being the total mass of each increasing stage is less than that of the previous stage. Although this assumption may not be the ideal approach to yielding an efficient or optimal system, it greatly simplifies the equations for determining the burnout velocities, burnout times, burnout altitudes, and mass of each stage. This would make for a better approach to a conceptual design in a situation where a basic understanding of the system behavior is preferential to a detailed, accurate design. One important concept to understand when undergoing restricted rocket staging, is how the burnout velocity is affected by the number of stages that split up the rocket system. Increasing the number of stages for a rocket while keeping the specific impulse, payload ratios and structural ratios constant will always yield a higher burnout velocity than the same systems that use fewer stages. However, the law of diminishing returns is evident in that each increment in number of stages gives less of an improvement in burnout velocity than the previous increment. The burnout velocity gradually converges towards an asymptotic value as the number of stages increases towards a very high number. In addition to diminishing returns in burnout velocity improvement, the main reason why real world rockets seldom use more than three stages is because of increase of weight and complexity in the system for each added stage, ultimately yielding a higher cost for deployment. A rocket system that implements tandem staging means that each individual stage runs in order one after the other. The rocket breaks free from the previous stage, then begins burning through the next stage in straight succession. On the other hand, a rocket that implements parallel staging has two or more different stages that are active at the same time. For example, the space shuttle rocket has two side boosters that burn simultaneously. Upon launch, the boosters ignite, and at the end of the stage, the two boosters are discarded while the main rocket tank is kept for another stage. Most quantitative approaches to the design of the rocket system's performance are focused on tandem staging, but the approach can be easily modified to include parallel staging. To begin with, the different stages of the rocket should be clearly defined. Continuing with the previous example, the end of the first stage which is sometimes referred to as 'stage 0', can be defined as when the side boosters separate from the main rocket. From there, the final mass of stage one can be considered the sum of the empty mass of stage one, the mass of stage two (the main rocket and the remaining unburned fuel) and the mass of the payload. An upper stage is designed to operate at high altitude, with little or no atmospheric pressure. This allows the use of lower pressure combustion chambers and engine nozzles with optimal vacuum expansion ratios. Some upper stages, especially those using hypergolic propellants like Delta-K or Ariane 5 ES second stage, are pressure fed which eliminates the need for complex turbomachinery. Other upper stages, such as the Centaur or DCSS, use liquid hydrogen expander cycle engines, or gas generator cycle engines like the Ariane 5 ECA's HM7B or the S-IVB's J-2. These stages are usually tasked with completing orbital injection and accelerating payloads into higher energy orbits such as GTO or onto escape velocity. Upper stages such as Fregat used primarily to bring payloads from low Earth orbit to GTO or beyond are sometimes referred to as space tugs. Each individual stage is generally assembled at its manufacturing site and shipped to the launch site; the term vehicle assembly refers to the mating of all rocket stage(s) and the spacecraft payload into a single assembly known as a space vehicle. Single-stage vehicles (suborbital), and multistage vehicles on the smaller end of the size range, can usually be assembled directly on the launch pad by lifting the stage(s) and spacecraft vertically in place by means of a crane. This is generally not practical for larger space vehicles, which are assembled off the pad and moved into place on the launch site by various methods. NASA's Apollo/Saturn V manned Moon landing vehicle, and Space Shuttle, were assembled vertically onto mobile launcher platforms with attached launch umbillical towers, in a Vehicle Assembly Building, and then a special crawler-transporter moved the entire vehicle stack to the launch pad in an upright position. In contrast, vehicles such as the Russian Soyuz rocket and the SpaceX Falcon 9 are assembled horizontally in a processing hangar, transported horizontally, and then brought upright at the pad. Spent upper stages of launch vehicles are a significant source of space debris remaining in orbit in a non-operational state for many years after use, and occasionally, large debris fields created from the breakup of a single upper stage while in orbit. After the 1990s, spent upper stages are generally passivated after their use as a launch vehicle is complete in order to minimize risks while the stage remains derelict in orbit. Passivation means removing any sources of stored energy remaining on the vehicle, as by dumping fuel or discharging batteries. Many early upper stages, in both the Soviet and U.S. space programs, were not passivated after mission completion. During the initial attempts to characterize the space debris problem, it became evident that a good proportion of all debris was due to the breaking up of rocket upper stages, particularly unpassivated upper-stage propulsion units. An illustration and description in the 14th century Chinese Huolongjing by Jiao Yu shows the oldest known multistage rocket; this was the "fire-dragon issuing from the water" (火龙出水, huǒ lóng chū shuǐ), used mostly by the Chinese navy. 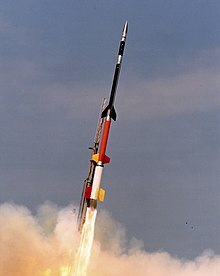 It was a two-stage rocket that had booster rockets that would eventually burn out, yet before they did they automatically ignited a number of smaller rocket arrows that were shot out of the front end of the missile, which was shaped like a dragon's head with an open mouth. This multi-stage rocket may be considered the ancestor to the modern YingJi-62 ASCM. The British scientist and historian Joseph Needham points out that the written material and depicted illustration of this rocket come from the oldest stratum of the Huolongjing, which can be dated roughly 1300–1350 AD (from the book's part 1, chapter 3, page 23). 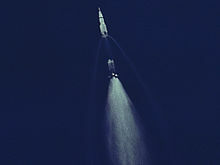 The first high-speed multistage rockets were the RTV-G-4 Bumper rockets tested at the White Sands Proving Ground and later at Cape Canaveral from 1948 to 1950. These consisted of a V-2 rocket and a WAC Corporal sounding rocket. The greatest altitude ever reached was 393 km, attained on February 24, 1949, at White Sands. In 1947, the Soviet rocket engineer and scientist Mikhail Tikhonravov developed a theory of parallel stages, which he called "packet rockets". In his scheme, three parallel stages were fired from liftoff, but all three engines were fueled from the outer two stages, until they are empty and could be ejected. This is more efficient than sequential staging, because the second-stage engine is never just dead weight. In 1951, Soviet engineer and scientist Dmitry Okhotsimsky carried out a pioneering engineering study of general sequential and parallel staging, with and without the pumping of fuel between stages. The design of the R-7 Semyorka emerged from that study. The trio of rocket engines used in the first stage of the American Atlas I and Atlas II launch vehicles, arranged in a row, used parallel staging in a similar way: the outer pair of booster engines existed as a jettisonable pair which would, after they shut down, drop away with the lowermost outer skirt structure, leaving the central sustainer engine to complete the first stage's engine burn towards apogee or orbit. Separation of each portion of a multistage rocket introduces additional risk into the success of the launch mission. Reducing the number of separation events results in a reduction in complexity. Separation events occur when stages or strap-on boosters separate after use, when the payload fairing separates prior to orbital insertion, or when used, a launch escape system which separates after the early phase of a launch. Pyrotechnic fasteners or pneumatic systems are typically used to separate rocket stages. ^ "Fregat". RussianSpaceWeb.com. Retrieved July 25, 2014. ^ a b Loftus, Joseph P. (1989). Orbital Debris from Upper-stage Breakup. AIAA. p. 227. ^ Johnson, Nicholas (2011-12-05). "Space debris issues". audio file, @1:03:05-1:06:20. The Space Show. Archived from the original on 2012-01-27. Retrieved 2011-12-08. ^ "火龙出水（明）简介". 星辰在线. 2003-12-26. Archived from the original on March 3, 2009. Retrieved July 17, 2008. ^ a b c d Needham, Volume 5, Part 7, 510. ^ "주화 (走火)". 한국민족문화대백과. 1999-09-25. Retrieved 2013-04-18. ^ Ulrich Walter (2008). Astronautics. Wiley-VCH. p. 44. ISBN 978-3-527-40685-2. ^ Balčiūnienė, Irma. "VIENO EKSPONATO PARODA: KNYGA „DIDYSIS ARTILERIJOS MENAS"!". www.etnokosmomuziejus.lt (in Lithuanian). Lithuanian Museum of Ethnocosmology. Retrieved 5 February 2018. ^ Simonaitis, Ričardas. "Lietuvos kariuomenei - 95". aidas.lt. Retrieved 5 February 2018. ^ "Falcon 1 – Stage Separation Reliability". SpaceX. Archived from the original on 30 April 2013. Retrieved 8 January 2011.